Integration is more important than ever, in all the systems of innovation we create. With multi-disciplinary DevOps teams, we build and operate solutions that encompass all tiers; from UX to back-end and everything in between. Middleware specialists are juse part of the team and share their knowledge on integration specifics through cross team guilds. More and more, we build those solutions based on the service paradigm. If we don’t need endless scale (if we’re not doing B2C basically), we just build it SOA style using PaaS technology. If we do need enormous scale and continuous innovation (because we don’t want to loose the consumers that get bored easily), we’ll do it microservices style. But we also still have to cope with existing systems. They can be legacy, but they can also be SaaS. Especially in a SaaS before PaaS before IaaS environment, migrating commodity applications to their SaaS counterparts are quick wins. But, these SaaS solutions are still most of the times silo applications that we have to cope with. For these applications, on-prem legacy or more modern SaaS, we need to create wrappers, so they can expose their task- and entity services or API’s so we can compose them into greater solutions. 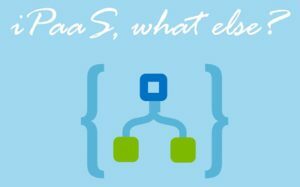 As a whole, we’re building agile solutions with a mix of silo applications, (micro)services applications and a set of building blocks provided by the iPaaS and aPaaS platforms we use. And in the Microsoft world, we’re talking about Azure then. In those environments, to me it does not make sense anymore to build new solutions with legacy middleware. To me, implementing a BizTalk Server on-premises (or in IaaS for that matter) just does not make sense anymore, in a greenfield environment. Of course, when you have already invested lots of time and money in an on-prem BizTalk based ESB, you should leverage that. And those environments will keep on running for years to come. But when it comes to new integrations, why use BizTalk? I can really only come up with 1 reason, and that is: “I really don’t want my integration middleware to be running in the cloud” (for whatever reason). But that decision does not have anything to do with technical capabilities. Let me try and clarify that. First of all, what we often hear is that it doesn’t make sense to use cloud integration middleware (iPaaS) if most of your systems run on-prem. Uh, why not? With an On-prem Data Gateway and an ExpressRoute connection, latency is not an issue. And talking about latency, the biggest latency in any integration built with BizTalk Server is the freakin’ MessageBox hops! Second, integrating SaaS applications is not something else (from a location point of view) than integrating on-prem applications. Most SaaS applications don’t run on Azure. Even Office 365 doesn’t run on Azure. So, what is “the cloud” anyway? From an integration perspective, integrating Salesforce from within Logic Apps is the same as integrating an on-prem SAP system when it comes to location dependencies or preferences! Third, legacy integration is not really that much easier with “out-of-the-box adapters”. It’s fairly easy to either use the On-prem Data Gateway or create a custom API app to talk to the legacy application. Most of the times, the number of interfaces is fairly limited. And, in a modern API based integration world, broad transaction scopes are not used anymore, so relying on idempotency and compensation logic is much more the norm. These type of interfaces are really easy to build as an API app. Apart from these three very important reasons, the last important point I want to make is this: We have been building monolithic ESBs. It is very hard to deploy individual orchestrated task services because of all the dependencies in BizTalk Server. BizTalk Server has in fact become a monolith (or makes it very hard not to implement monolithic solutions) which in most cases is very hard to manage and monitor. iPaaS makes it much easier to deploy, manage and monitor integration solutions. With ARM, Application Insights, Azure Monitor and of course the Azure portal, it has become really manageable. And as soon as Service Map also makes it to PaaS, we’ve really evolved into a much more mature iPaaS than BizTalk Server has every been. I’m really a fan and don’t see any reason anymore why we should implement new integrations on-prem!